As is often the case in heated political debates, rhetoric and reality don’t always align in the Bears Ears debate. Let’s break down this TownHall op-ed by conservative columnist Paul Driessen and separate fact from fiction. Talking Point: "Utah residents and elected officials applauded [President Trump’s] move as long overdue." While it is true that some Utah residents and elected officials cheered Trump's Executive Order, there were a good number of Utah residents - including plenty in San Juan County, home to Bears Ears National Monument - who were distressed and offended by it. 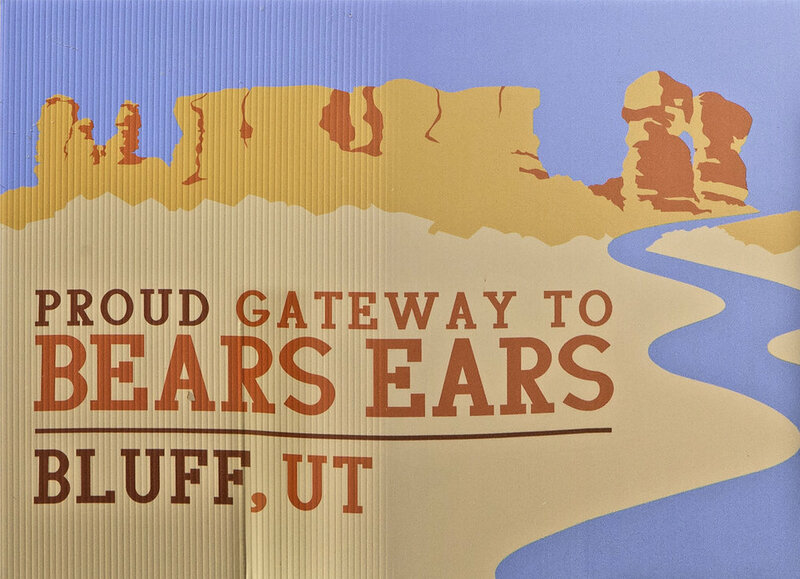 The vast majority of residents in the small community of Bluff, located in southern San Juan County near the border of the Navajo Nation, support the monument wholeheartedly; many residents and businesses displayed signs proclaiming Bluff the “proud gateway to Bears Ears.” And then, of course, there are the county’s Native residents, whose traceable presence on the land predates that of their Anglo neighbors by centuries and who consider the land to be sacred, imbued with tremendous cultural and spiritual significance. A small group of Navajos and Ute Mountain Utes in San Juan County oppose the monument on the grounds that its designation could rob them of lucrative extractive-industry jobs and portend more mistreatment of Natives by the federal government. But a large number of Natives in San Juan County supported the monument designation and have protested Trump’s action to shrink the original monument from 1.35 million acres to just over 200,000 acres. Starting in 2010, a grassroots group of Navajos in San Juan County began mapping Native archaeological sites, hunting and ceremonial grounds, places to gather medicinal and ceremonial herbs, and other sacred places in order to make a case for protection of the Bears Ears region. The resulting maps generated by the group, which became the nonprofit Utah Dine Bikeyah, laid the foundation for the Bears Ears National Monument proposal. These residents of San Juan County did not just support the monument; they played a critical role in bringing it into being. "[Past presidents] established enormous de facto wilderness areas with the stroke of a pen – usually with little or no consultation with people and elected officials in communities that would be most severely impacted." OK, OK…time for a reality check. While this has been an issue with some previous monument designations, particularly Grand Staircase-Escalante, before the designation of Bears Ears National Monument, there were years worth consultation with locals. When we first started speaking to sources for our book in April 2015, people on both sides of the monument debate said they would prefer a legislative solution to a monument designation. Why? Two reasons: First, legislation allows for far greater specificity than a necessarily brief and general monument proclamation; second, a monument created through an executive order as opposed to a congressional vote would be seen by many in San Juan County as overreach by the federal government. We know how that played out. The important thing to note is, there was an effort to bring diverse groups together to create a legislative compromise which would be accepted, if not outright embraced, by all parties. In early 2013, Congressman Rob Bishop (R-UT) invited citizens of eastern Utah's eight counties to participate in the Public Lands Initiative, an attempt to devise a solution to a decades-long struggle. Bishop’s promise: to use feedback from local people to craft a “grand bargain” that would give all stakeholders a voice. Conservationists had a chance to secure protection for treasured landscapes, and multiple-use proponents had an opportunity to open trails used for recreation and to keep alive the extractive industry and ranching economy. San Juan County Commissioner Phil Lyman led a local effort to create and submit to Bishop a roadmap for managing land in the county, inviting a select group of county stakeholders—conservationists, ranchers, ATV enthusiasts, extractive-industry representatives, as well as representatives of local tribes - to serve on a Lands Council tasked with developing a plan. The major takeaway: Elected officials provided ample opportunities for citizens to share their opinions. Unfortunately, the PLI process failed. The final bill was introduced in September 2016 but never came to the floor of the House for a vote. Many involved in the process, as well as outside observers with a stake in the outcome, felt that Bishop did not heed local voices to the extent that he might have and/or crafted a plan that favored extractive industries or was driven by ideology instead of a true desire for compromise. Feeling that the PLI process had run its course without success, in December 2016, Obama acted to protect the land in perpetuity by establishing Bears Ears National Monument. The designation fueled the bitter conflict between monument supporters and opponents that culminated in President Trump's move earlier this month to shrink Bears Ears by 85 percent. Bishop has been one of the most outspoken supporters of Trump's decision and says he now plans to introduce legislation that would significantly weaken the Antiquities Act, thereby constraining the ability of future presidents to protect public lands through monument designations. In the current political climate, the thought that there ever was a chance at compromise now seems hopelessly naive. "President Obama designated the 1,351,849-acre Bears Ears NM three weeks before leaving office, largely to make still more energy, mineral and other resources off limits to exploration and development. He too did so without prior consultation with Utah’s governor, congressional delegation or residents." The first half of this is mostly true. Obama did indeed designate Bears Ears three weeks before leaving office, and part of his motivation was to protect pristine areas of the Bears Ears region from energy exploration and development. Just as or perhaps more influential, though, was his decision to honor the five tribes - the Hopi, Navajo, Ute, Zuni, and Ute Mountain Ute - which consider the land in the monument to be sacred ground and whose leaders proposed a unique system of land management. The Bears Ears Inter-Tribal Coalition included in its monument proposal an arrangement in which tribal representatives would work alongside federal land management agencies – the U.S. Forest Service and Bureau of Land Management – to develop a plan for how the monument would be run: which sites to advertise and which to protect through limited visitation; which areas to open to wood and plant gathering by tribal members; and so on. This plan would be informed by indigenous traditional ecological knowledge, which Obama’s proclamation calls “a resource to be protected and used in understanding and managing this landscape sustainably for generations to come." Such an arrangement would also have given Native peoples a new and powerful role that put them on par with the federal government, which as many tribal leaders have pointed out is completely appropriate, given tribes’ status as sovereign nations. Trump's executive order claims that his predecessor's monument proclamation "prevents many Native Americans from having their rightful voice over the sacred land where they practice their most important ancestral and religious traditions." Yet the Bears Ears National Monument proclamation, based on a proposal written by members of the Coalition of five tribes, explicitly allows for traditional access to the land by Natives; it was intentionally designed to protect sacred sites as well as the plants and animals on which the region's indigenous peoples rely for sustenance. Officials in the Trump administration did not consult with tribes before making changes to the original monument boundaries but assumed that giving them co-management authority over the new monuments would satisfy their needs. As for the claim that the Obama administration designated the monument without prior consultation with Utahns and their elected representatives: see the PLI discussion above. There was a years-long effort, led by Utah Congressmen, to engage San Juan County residents in a process to determine the future of public lands within county borders. Utah Governor Gary Herbert was very much in the loop as well. What's more, the Bears Ears Inter-Tribal Coalition unveiled its monument proposal in October 2015, more than a year before Obama established Bears Ears National Monument. To present the designation as an act that caught Utahns unawares is misleading. "To suggest that these monuments are now too small to safeguard their unique habitats, scenic areas, fossil sites, antiquities and Pueblo ruins is simply absurd – and disingenuous." The above statement assumes that the goal was to protect individual sites, many of which remain protected. What it doesn't address is the additional goal of Obama's proclamation - landscape-scale protection. The Bears Ears region contains an extraordinary diversity of plant and animal species that rely on the vegetation and water sources within the initial monument boundaries. When the monument was reduced by President Trump, the permanent protections for the landscape fractured, leaving vital parts of the local ecosystem vulnerable. In addition, Natives and archaeologists believe that telling the history of peoples who trace their ancestry to the Bears Ears region requires not only protecting specific, well-known archaeological sites, but the full diversity of sites spanning Bears Ears National Monument, estimated to be well over 100,000 in number. The significance of this region to archaeologists is self-evident; less so is its significance to all of us. As Utah-based archaeologist Jonathan Till explains, "The big questions that should be concerning us are, what are the conditions around the physical development of human beings, what are the conditions or circumstances surrounding the development of the human mind, what are the circumstances around the development of agriculture, and what are the circumstances or problems associated with the process of urbanization, or becoming a city dweller. Two of those four questions can be [answered] best in other parts of the world. But the latter two, that of addressing farming and of addressing social complexity or urbanization are best addressed right here, in the Southwest in general, but more specifically, here in Four Corners. This is the place to come on the planet to grapple with those two questions."